Compare brand new Ssangyong Korando Estate lease deals! All Korando Estate deals include delivery, road tax and a full manufacturer’s warranty. We collect the best Ssangyong leasing pricing from across the industry, saving you time and money. Select a trim below to get started. Which Ssangyong Korando Estate Trim Should I Choose? The SsangYong Korando has always been an affordable option for those looking for a compact SUV or Crossover, but it's always lagged a little behind obvious rivals in terms of technology. In recent times though, the Korean brand has been making up ground and this latest model features the option of features like front and rear safety cameras and a centre-dash infotainment display with a smartphone mirroring function. To draw the attention of buyers to these embellishments, there's now a smarter front end look too. Plus the 2.2-litre diesel engine beneath the bonnet is as capable as ever. 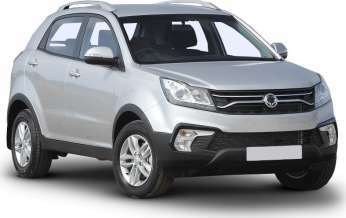 Here you can view the pricing history for the Ssangyong Korando Estate on LeaseFetcher. What is the fastest Korando Estate option? The Korando Estate 2.0 SE 5dr is the fastest trim. It will go from 0-62mph in just Unknowns and has a top speed of 101mph. What is the most fuel efficient Korando Estate option? The Korando Estate 2.2 SE 5dr is the most fuel efficient trim. In urban environments, it will achieve 39.8mpg and on the highway it will achieve 54.3mpg . Its combined fuel efficiency is 50.4mpg. What is the most eco-friendly Korando Estate option? The Korando Estate 2.2 SE 5dr is the most eco-friendly. It emits just 139g/km of CO2. What is the cheapest Korando Estate option? The Korando Estate is the cheapest to lease. It costs just £261.56 per month with an initial payment of £3,138.72. That's for a 4 year deal with 8,000 miles.